Stylish. Stimulating. Secure. Capable. The new 2018 Jeep Compass is better than ever and ready to take on the roads. The compact SUV has a bold and confident exterior with a refined premium interior, along with the capability to hit the backroads with the best of them. The 2018 Jeep Compass is both comfortable and affordable too, so there’s there’s not a lot this SUV doesn’t have. 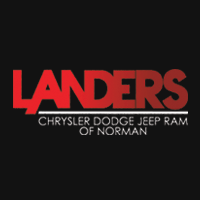 The best place to get your hands on one is Landers Chrysler Dodge Jeep Ram in Norman, Oklahoma. The Compass embodies a crucial step in the evolution of the legendary Jeep design. Immediately you notice the signature seven-slot grille and trapezoidal wheel arches that have become iconic symbols of the Jeep. It has a bold and upscale take on the look though, featuring a sleek, aerodynamic profile with athletic styling and sweeping curves. The sloping roofline makes for a stunning profile and a powerful statement about this SUV’s capabilities. It looks like a high-end vehicle, but it also looks like it belongs on the backroads. An effortless blend of form and function, the signature taillamps take night drives to the next level. The taillamps are perfectly molded to the curves of the Compass, and they come standard with remote rear reflex and fog options. You can opt for LED lighting as a premium option for both the taillamps and headlamps. The 2018 Compass comes with a choice of 8 different available wheel designs, each one engineered to perform in the city and on the trails alike. The inside of the 2018 Jeep Compass is just as bold and enticing as the outside, creating the ideal environment for the modern adventurer. Jeep is known for being rugged, but that doesn’t mean comfort has to take a back seat—and it definitely doesn’t in the 2018 Compass. It even offers a selection of available leather-trimmed seat colors and available heated front seats. The Uconnect system has a choice of a 5, 7 or 8.4-inch touchscreen with a high-res display and ultra-quick response times. Through the Uconnect system you can use voice commands, connect to bluetooth, play music through Apple Carplay and Android Auto, access all your favorite apps, and more. You can also get an available dual-panel sunroof, heated steering wheel or dual-zone climate control system. With rear passenger controls and steering wheel-mounted controls, you’ll always have everything you need at your fingertips. The 2018 Jeep Compass is durable and resilient with the latest technology and engineering to protect you along with more than 70 available safety features. The body of the Compass is so strong, it’s essentially a big metal safety blanket with high-strength steel and an extremely sophisticated airbag system with seven standard airbags. The SUV is brimming with features to help you maintain control and stay out of harm’s way. Some of those features include LaneSense departure warning with Lane Keep Assist, Forward Collision Warning with Active Braking, Blind Spot Monitoring, Rear Park Assist and Backup Camera and available automatic headlamps. You can also get available rain-sensing wipers that automatically activate when it starts raining. Features like the hands-free controls and SiriusXM Guardian app help ensure that you avoid any security issues before they become a problem. The 2018 Jeep Compass comes ready to take on even the toughest trails when you get the Trail Rated Trailhawk model. The Jeep Compass Trailhawk has legendary traction, ground clearance, maneuverability, articulation and water fording abilities. You’ll never have to worry about getting stuck, because the 2018 Compass delivers best-in-class 4×4 capability along with Selec-Terrain Traction Management System and Jeep Active Drive Low 4×4 system. The Compass Trailhawk comes with red tow hooks, underbody skid plates and an aggressive front and rear fascia for the best possible approach and departure angles. You can amplify performance and efficiency even more with the 2.4L Tigershark engine. MultiAir2 technology maximizes intake manifold pressure and manages combustion quality to help the engine run more efficiently and effectively. With the available nine-speed automatic transmission, you can optimize engine output even further and enable aggressive launches and smooth power delivery. Stop by Landers Chrysler Dodge Jeep Ram of Norman to take a look at the iconic 2018 Jeep Compass and take one for a test drive today. In the meantime, check out our online inventory.